Microsoft is a well-known leader in technology. Chances are, you use Microsoft hardware or software products in your daily life. Microsoft publishes a great deal of content to the web, not only in promotion of their products, but also for education on topics of technology, security and more. We have designed and developed several properties for Microsoft on the WordPress platform. 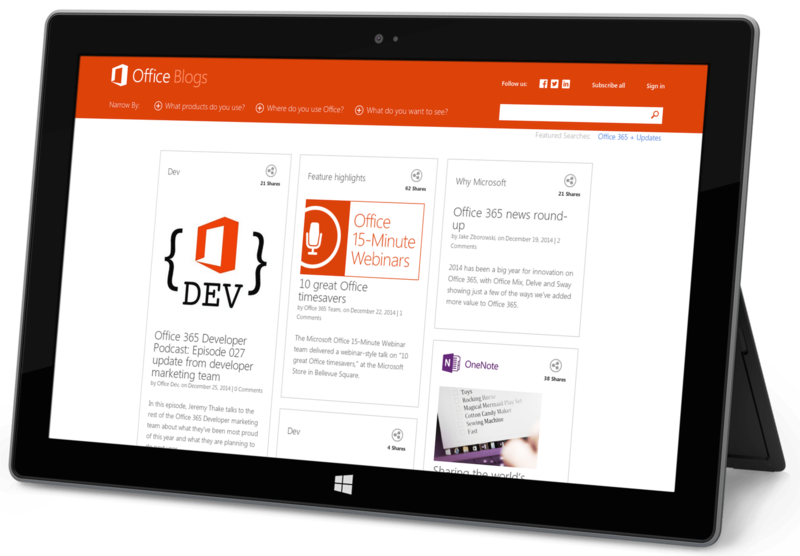 Welcome to the official blog for the Microsoft Office suite of products. WordPress makes writing, editing and publishing articles on the Office blogs a breeze. The filtering options allow the visitor to get your questions answered, learn new tricks and get caught up on the latest news. Office blog is home to Garage Series- the official show for the latest Office 365 technology stunts, innovations, engineering commentary, unique demos and more. Like many of the Microsoft blogs, Office Blog needed us to migrate almost a decade of data from a proprietary system into WordPress. Not all sections of the Office blog are the same. Our team designed custom templates to account for mixed media, such as videos on certain areas of the website. We have developed a long-term relationship with Microsoft to provide ongoing support and maintenance for their blogs for updates, training and new feature requests. The Microsoft Office Blog is home to a number of different Office products. In order to help the visitor narrow down their search to the products or topics they are interested in, a number of filters have been set up. This gives you the ability to sort by one or many products and topics in the news feed. Filtering is as simple as clicking on the desired products or topics and selecting Apply! We worked with Microsoft to create a unique template to showcase videos in a special area of the Office blog titled Garage Series for Office 365. The Garage Series template includes many of the special features that you see throughout the rest of the Office Blog, but presents it in a more sensible, organized manner for videos. This section also includes a highlighted section at the top for the most recent show followed by an archive of past shows. For all shows, clicking Watch Show brings up a lightbox with the video embedded to watch right away while clicking Read Post sends you to an in-depth post about each show to accompany the video.